Coast Chart No. 110 Cape Cod Bay Massachusetts. An attractive large format 1892 U.S. Coast Survey nautical chart or maritime map of Cape Cod Bay. 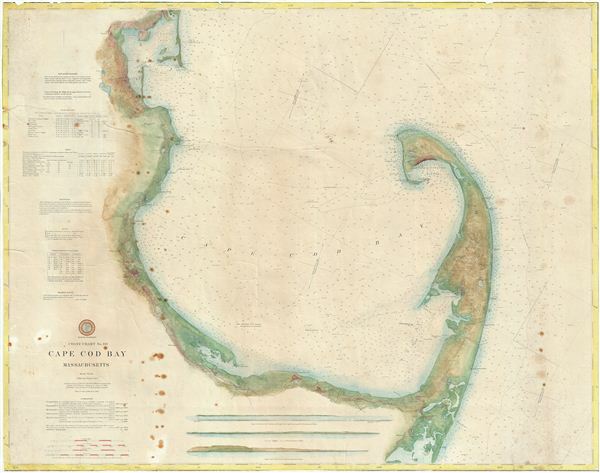 The chart follows the Massachusetts coastline from Duxbury Bay to Provincetown at the tip of Cape Cod and south as far as Nickerson's Neck. exhibits the meticulous detail and accuracy typical of U.S. Coast Survey work of the late 19th century. Countless depth soundings throughout. At the base of the map there are three land profile charts - intended to help navigators identify prominent features on distant shorelines. The left hand quadrants of the map feature various tables, sailing instructions, notes on soundings and tides, and a wealth of other practical information for the mariner. This is a working nautical chart and has seen better days. The margins have been trimmed to the neatline and the map itself exhibits wear, discolorations, and toning. Nonetheless, it retains a kind of maritime charm. Prepared on a Polyconic Projection at a scale of 1:80,000. This chart was first published in 1872, the present example being the updated 1892 edition issued under the supervision of T. C. Mendenhall, Superintendent of the Survey. Average. Map exhibits various issues common to working nautical charts: frayed edges, staining, and one large repaired tear. The map has been professionally flattened and backed with archival tissue for stability.